Seek guidance from the Lady of Twilight against a common foe. Archcanon Tarvus revealed himself to be Barbas, the hound of Clavicus Vile. In an effort to locate and take control of Clockwork City, he tricked me into helping him drain Lord Vivec's energy. I need to stop Barbas and recover Lord Vivec's energy. Talk to Vivec in his Palace. Talk to Seryn in the Archcanon's Office. Gain access to the Clockwork City. Meet Barilzar in the Maintenance Junction. Follow Barbas to the Divinity Atelier. Destroy the Clockwork Defense Cores. Enter the energy reservoir and defeat Barbas. Reverse the polarity of the energy flow. 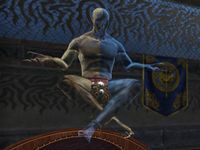 Start this quest by speaking to the ghostly form of Vivec in Vivec's Private Chambers. Leave the palace and go down to the Archcanon's Office. Seryn will be waiting for you, and will start talking as soon as she sees you: "Outlander, over here. I've been trying to find something that makes sense of all-" She gets cut off by Azura possessing her, saying "Mortal, the Lady of Twilight has words for you!" "So Vivec deigns to ask for help? I foresaw such an event, but scarcely believed it. Listen well, for if you continue to perform flawlessly, we might yet thwart the efforts of Clavicus Vile and his hound, Barbas." Lord Vivec said to ask you for guidance in this matter. "Just as I anticipated. The mysteries reveal that Barbas seeks to enter the Clockwork City. So far, Sotha Sil's wards have impeded him, but the hound has Sunna'rah. You must beat him to the prize - the reservoir that holds Vivec's stolen energy." 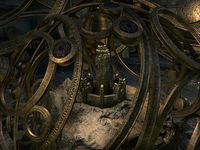 Do you know where the Clockwork City is located? "Such knowledge has been hidden even from me, Mortal. But I know someone who can provide you with the means to travel to Sotha Sil's creation. Stand back and I shall summon the mage of cogs and gears." Azura opens a portal and summons Barilzar. He is momentarily confused about what happened and where he is, but figures it out when you talk to him. "Interesting. Summoned by a Daedric Prince and her mortal mouthpiece. I was right in the middle of a crucial experiment, but I suppose I can spare a few clicks of the cogs for Azura and my erstwhile assistant. So, did you break the tonal inverter?" No, the tonal inverter worked fine. Azura wants you to help me get to the Clockwork City. "No, not going to happen. No offense to the Lady of Twilight, but Sotha Sil was quite adamant about keeping the place hidden and warded against the Daedra. Oh, wait. Pistons fall into place. This concerns Sunna'rah and Lord Vivec, I presume?" Yes. Barbas tricked us into draining Lord Vivec's divine energy. So Sotha Sil's forgotten tool was modified to steal Vivec's energy, which in turn energized the Clockwork City. Lit it up like the top of Red Mountain. Even Vile's dog would be able to see that!" Can you get me to the Clockwork City or not? "What is Barbas after? Wait, gears click into place…the reservoir! You need to reach the reservoir that contains Vivec's stolen energy before Barbas! I can get us to the entrance in Seht's Vault, beneath the Mournhold temple. Ready to go?" You're coming with me? All right, let's go. Once you answer that you're ready to go, Barilzar pulls out a book and starts opening a portal to Seht's Vault. He says that you'll need his help because he knows the city "almost as well as Sotha Sil". Follow him through the portal, and you'll arrive at the top of a ramp in a cave. Go down the ramp to catch up with Barilzar, and he'll lead you down a passageway to a large chamber being patrolled by a handful of Skaafin. Deal with the enemies at the top, then go down the hill to a bridge. Barilzar will warn you that the skaafin have agitated one of the guardians. Cross the bridge, deal with the skaafin, then turn left and go up a small staircase. There you'll find the Clockwork Guardian, standing between you and the entrance to the Clockwork City. Defeat the Clockwork Guardian, taking care to avoid his fire breath. Once he's down, Barilzar will catch up with you. You can talk to him before entering the city if you wish, and he'll explain why it is so small (and that you're going to shrink down to get inside). When you enter the city, you'll find that the path ahead is initially blocked by an electric barrier, controlled by Barbas. Walking towards it will trigger Barbas to taunt you ("Ah, my favorite dupe has finally arrived."). Barbas will then lower the barrier and run off laughing. You can follow after him and talk to him (once he's behind another barrier), or just follow Barilzar through the now-accessible door to the Maintenance Junction. If you talk to Barbas, he will tell you that you'll be able to witness his greatest achievement: bringing his Master's plan to fruition! But when questioned about what that plan is, he wises up and decides not to "give away the surprise". 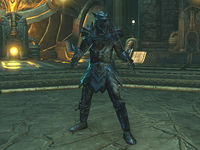 The only other information Barbas will reveal is that his Master has been trying to get into the Clockwork City for a long time, and that the Archcanon died peacefully in his sleep. Go through to the maintenance junction, and you'll find Barilzar at a control panel. If you talk to him, he says he's disabled the most of the defenses in the junction, and that he can open routes that Barbas does not know about to find the reservoir. Barilzar believes that Sunna'rah would have sent Vivec's power to the atelier where Sotha Sil studied divine energy. The maintenance junction is a linear route. You'll run into some factotum enemies, as well as spinning, moving blade traps (which can't be attacked). Soon you'll reach two gates: an eastern gate and a western gate. You need to disable the couplings for each one in order to open them both. Barbas is on the other side. Follow him down a hallway until he summons two skaafin. He'll run through a door while you're fighting them, and you have to find another way to get to him. This translates to following the hallway around to another door. As you approach that other door, a skaafin named Jovval Mortal-Bane will appear. Defeat him and you can proceed through the door to the access bridge. From the bridge, you can see another bridge…the one Barbas is on. He taunts you some more ("Look, Master! Vivec's toy found a way through, just like you said! But Barbas has Sunna'rah! What does Vivec's toy have?"). Barilzar responds "Vivec's toy has me, you annoying creature", as he leads you to the door to the Engineering Junction. The engineering junction is another linear pathway with blade traps. You'll also encounter some fabricant enemies, who presumably are responsible for the dead skaafin you see. The next door you get to brings you to the atelier courtyard. Barilzar will remark on how beautiful it is, and you can optionally talk to him before moving on to the Divinity Atelier. If you do talk to him, he'll tell you more about the purpose of the atelier, and what he thinks Barbas intends to do there (use the divine energy to open a portal to bring Clavicus Vile to the Clockwork City). Barilzar goes over to a control panel (supposedly to lower the defenses in the atelier), leaving you to enter the atelier alone. Whatever Barilzar is doing in the courtyard is not very useful, however, as you have to defeat three Clockwork Cores in order to get to the reservoir room. Defeating the Clockwork Defense Core opens the way to the South Platform, where you will find and defeat the Clockwork Mediator Core. Doing so will unlock the North Platform, which contains the Clockwork Assembly Core. After defeating that, Barilzar will tell you that he was able to activate the controls to unlock the final platform (the one with the reservoir). Go up the ramp to the final platform. You have finally caught up with Barbas, and now it's time to fight him. He is wearing new armor for this battle including a helmet that looks like an angry dog's head. He starts off with melee attacks, but after a while decides to "give you a taste of [his] divine power", and starts using magical attacks, including summoning skaafin. He drops Sunna'rah once you defeat him. Pick it up and use it on the reservoir to pull the energy back into the staff. Barilzar opens a portal to bring you back to Vivec's palace. As you walk over to the portal, Clavicus Vile revives Barbas (in dog form) and opens a portal to Oblivion for him. Go through the portal Barilzar opened, and you'll end up…not in Vivec City. In fact, you end up in a cavern with a shrine to Clavicus Vile. Clavicus Vile will be talking to you as you arrive, "So you're the mortal who gave my poor dog so much trouble. I suppose we should have a chat, you and I." Go to the statue of Clavicus Vile and talk to it. An apparition of Barilzar appears, much to the annoyance of Clavicus Vile. Talk to him. 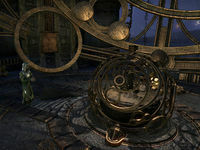 "I lost you somewhere between Clockwork City and Vivec, but it was simple enough to trace your energy signature to this Daedric shrine. Unfortunately, some power is interfering with my efforts to open a portal for you." It's Clavicus Vile. He wants to trap me here for a few decades. "Hmm. That would be unfortunate for you. Luckily, you have me to assist you. Well, me and Sunna'rah. 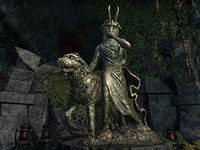 Expend a small amount of Vivec's energy at the statue and that should provide enough of a distraction for me to pull you out of there." 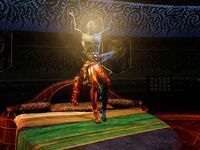 Use Sunna'rah on the statue, and after zapping for a few seconds, you'll be automatically transported to Vivec's palace. You reappear in Vivec's private chambers. Barilzar and Seryn are already there. Barilzar is surprised that his idea to zap the statue worked. Go and talk to Vivec. "To quote my … seventy-fifth exhortation … "certainty is the brother of fear." Use the staff in the same way that you used the Blessing Stone in Divine Disaster. It will zap Vivec and his corporeal form will rise up to meet his ghostly form. As Canon Llevule says, "Praise Vivec, his energy is restored!" Talk to Vivec once more to finish the quest. At this point, you can accept your reward and complete the quest, while the conversation continues and starts Divine Blessings. Lord Vivec wants me to consult with Azura's champion, Seryn, and see if her patron has any wisdom to share concerning Clavicus Vile and Barbas. She should be in the Archcanon's office, looking for clues. Azura possessed Seryn again. I should talk to her and see if she has any advice on how we deal with Clavicus Vile and Barbas. Azura summoned Barilzar to help me get to the Clockwork City. I should talk to him and see if he knows where Sotha Sil's creation is hidden. 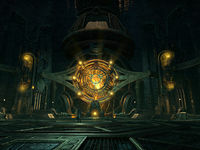 Barilzar can't teleport us directly to the Clockwork City, but he can open the secret entrance to the city, located underneath the Tribunal Temple in Mournhold. I should enter the portal and follow Barilzar. I need to clear a path through the Daedra so that Barilzar and I can reach the entrance to the Clockwork City. We made it past the Daedra and defeated the Clockwork Guardian. Now to enter the Clockwork City and see what's waiting for us inside. Barbas locked the path ahead of us. To follow after him, we need to enter the maintenance junction and navigate through its twisting paths. I need to disable the repair factotums and the couplings to open the way ahead so I can get past the gate. We spotted Barbas. I should find a way to follow him. The workshop where Vivec's divine energy is stored is just ahead. I should go inside and try to stop Barbas before he gains access to all that power. I need to find a way to access the energy reservoir before I can retrieve Vivec's stolen power and get my hands on Barbas and the staff. Now I need to enter the final chamber to defeat Barbas and take back Sotha Sil's staff, Sunna'rah. I defeated Barbas. Now I need to take Sunna'rah and use it to reverse the flow of divine energy. I stopped Barbas and gathered Vivec's divine energy into Sunna'rah. Now I should use the portal and return to Vivec City. The portal didn't return me to Vivec City. Instead, I appear to be inside some sort of Daedric shrine. And Clavicus Vile just addressed me. I guess I should talk to him. Barilzar has projected an image of himself into this strange place. I should talk to him. 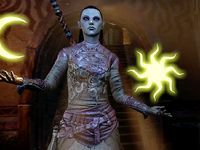 Barilzar suggests that I use a small portion of Vivec's energy to distract Clavicus Vile so that he can pull me out of this place. I should use Sunna'rah on Vile's statue. Barilzar succeeded and returned me to Vivec's Palace. I should talk to Lord Vivec and see what I need to do to restore his stolen energy. Lord Vivec wants me to use Sunna'rah and restore to him his divine energy. Finishes quest I did as Vivec asked and restored his divine energy. I should talk to him and make sure he's all right now.